Squalls and unsettled weather greeted crews on the final day of competition at the 2015 18ft Skiff Australian Championship on Waterloo Bay, Manly. Between rain fronts the bay was barely ruffled by constantly shifting winds at less than 5 knots, making setting a sailable course challenging for race officials and sailing a highly tactical affair for the crews. Crews drifted along the line ahead of the 12 o’clock start, with virtually no wind at all. A lacklustre start saw Oliver Hartas’ Ilve appear to pull away on the right of the course, but it was series leader Gotta Love It 7 that maximised a shift of clean wind off the start. Sailing on the edge of a cloud line, up the left of the course, Seve Jarvin and his crew sailed to a convincing lead with Lee Knapton’s Mojo Wine and and Michael Coxon’s Thurlow Fisher Lawyers in toe. Race officials held the fleet hoping that one of the passing fronts would draw enough breeze to get a start and ensure that they were able to constitute a series. 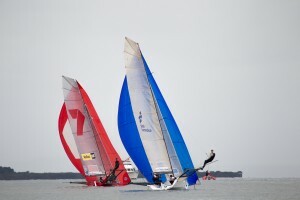 Shortly before the Sailing Instructions cut-off time of 2pm, officials made the call that a new course would be laid and a “sprint” conducted to conclude the Championship. This was news to the crew of Pure Blonde, who had sailed for the beach after the first race, under the impression that sailing had again been abandoned for the day. Thurlow Fisher Lawyers emerged cleanly from the fleet in a farcical start with little wind to propel the fleet forward. While crews struggled to drift away from the line, Coxon and his crew worked a good shift straight down the middle of the course. Gotta Love It 7 and local entry Smit Lamnalco, skippered by Josh Franklin, appeared to be using local knowledge; taking a line that maximised what little breeze was now blowing across the course. While 7 were first to round the top mark, a poor tactical choice in the run to the line saw them left drifting in the fickle breeze while the crews of Thurlow, Mojo and Keagan York’s Compassmarkets.com sailed away to a strong lead down the right side of the course, with Mojo eventually taking the narrow win over Thurlow on the line. Speaking in the rigging yard after, the 2015 18ft Skiff Australian Champions Gotta Love It 7’s Seve Jarvin said they were pleased to walk away with the win after a challenging weekend of sailing. “What can we say. It was a pretty tricky series. It’s a shame we didn’t get more racing in. The other guys, Lee (Knapton) and the Mojo team were close in the end. Given the racing was tricky, anyone could have won it today. We’re happy to come away with a win,” he said. While the League boats may have dominated the series, local crews put in valiant efforts, often using local knowledge of tide and wind to strongly challenge the visiting crews. Dan Smith from Smit Lamnalco, who finished second to Ben Simerville’s Tradelink in the handicap placings, admitted that this “local knowledge” was key in dealing with the tricky conditions on the final day of racing. “It did help here and there, but the Sydney guys are still just good sailors in general. It was pretty even racing at the end of the day,” he said. He was optimistic about his crews performance, given the calibre of the Sydney fleet, and believed that the event would have a positive impact on drawing more interest from local sailors to sailing 18s and the Brisbane 18 Footers Sailing Club. “Yeah definitely, it will make a huge difference. 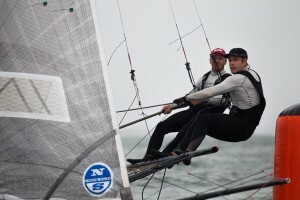 A new boat or some new sails would help us to be competitive in and take it to another league,” Smith said. 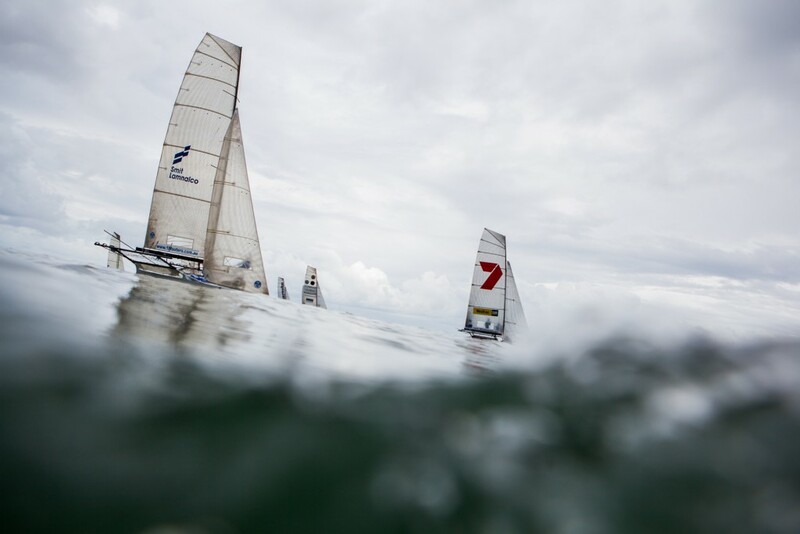 The Brisbane 18 Footers would also like to thank Andy Gough for his photography services, and Miles Ruge for his race reports throughout the series.